Used the Elk beam this past weekend for the Pacifica Cert Drill on 2m FM and 2m USB, running at 50 watts Net Control had no trouble hearing me. This antenna continues to work fantastically well. This beam is up 40′. Jeff here from NC. Well, I got the 220 MHz and the 2M/440L5 MHz antennas mounted side by side and I could not be any more pleased. You were correct in everything you said they would be. SWR is 1:1 on both with 100 ft of LMR 400. 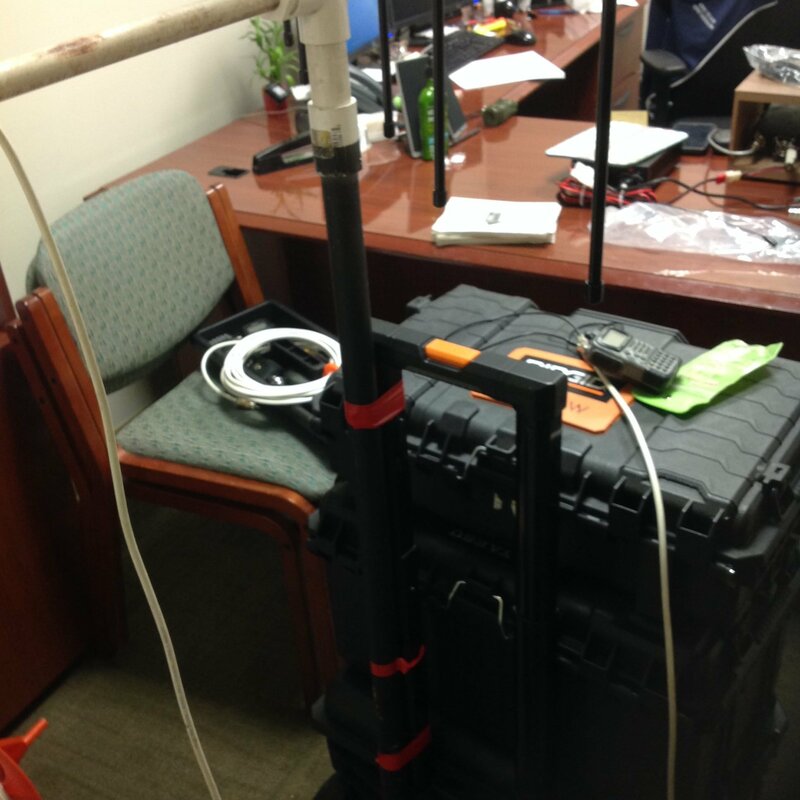 Getting excellent reports of signal strength and modulation clarity. Thanks for all your help and advice on mounting and getting the most out of my setup. Hitting repeaters 100 miles away with 30-40 watts. I’ve attached a photo to show you too how they are camouflaged from the HOA folks around the surrounding trees. Thanks for such a great product for our market. I have built many “Sat” antenna’s. My latest was a “QFHA”, for 2 mtrs. Hears really well. I am going satellite “portable” soon. I didn’t like the idea of 2 separate antennas. I did not care for the X elements on the boom. Not very “portable”. I, “pondered” the idea of building a U/V ant. with the the elements on the same “plane”. And, removable elements. You BEAT Me to it ! Nice Job, Really well done. It’s going on the “road” soon. Look out AO-92. Here I come. From VE2…. Just to let you know your antenna is ridiculous! I make contacts EVERY time i take it out. I’m using my Yaesu handheld on about 2 watts or less in full-duplex mode. I just need to tidy up my set up and i have a great satellite rig on the FM birds. I’m hooked! I gotta check out the other birds on sideband but don’t have a rig for that. Initially I used a J-pole antenna for VHF/UHF repeater contacts. Living in a valley, my coverage was only to local repeaters within a 10 mile radius. However, I was very pleased to see my range was extended to approximately 90 miles once I started using my Elk log periodic . RST reports were consistently 59 with clear reception on my end. I used the antenna during 2018 Field Day and got a lot of compliments. The antenna is well designed and sturdy with assembly and disassembly a piece of cake. It is ideal for fox hunts and satellite communication. All in all, a great antenna. A few months ago I purchased a 2m/70cm antenna from you and after taking some time to figure out how to engineer a way to use it with a metal Buddipole tripod, I used it last night for the first time with our local ARES net. I basically used the PVC handle you included, but I extended the two antenna connectors by 12″ so it was further from the metal pole, and I added a notched piece of PVC to support the antenna wire so it would be straight. I’m attaching a picture (see below). I’m working in an RV park this summer and my HT cannot hit our repeater even with a Diamond Antenna! I plugged your antenna in my HT and folks on the ARES net said I sounded like I was sitting in their living room! Thanks for a GREAT product! I am very happy with it. Received the antenna this morning (sat) and was able to make 2 contacts on AO-91 with just a 14deg pass using my FT 60 HT an hour later. This was thru trees to boot! Worked several people doing the Wal Mart Parking Lots on the AIR contest (WMPLOTA) . I just received the antenna… and I have to say I’m really pleased with the craftsmanship. Checked the SWR as well … excellent on both bands !! This is certainly money well spent. WOW I got this antenna from HRO in Atlanta, GA and just WOW I’m so impressed! I really love this antenna, it’s my favorite piece of gear now. I have the 2M/440L5 dual-band one. I plan to put a review on eham.com, but I personally wanted to take a moment to THANK YOU for making such a nice thing for the ham radio community. I wish I would have known about it sooner. I found out through YouTube.com and people working satellites. I’m hitting repeaters I never could before. I run nets as net control and I’m finally full quieting. I would really love to see a some kind of stand (perhaps with something to rotate it) for this thing though, I wish you guys made one. I’d buy it in a heartbeat. Right now its on a PVC pipe, which is fine. Again, thanks again for making such a thing. Care to make one for HF?!? ? A warning came on the dashboard indicating a tire was low on air. In the past when this happened It was necessary to drag the old compressor out fill it up with air then to the appropriate tire and fill it with air. Now in my delicate condition it is a sight for sore eyes. Diane used to sell tickets. At one time I had bought a very small compressor that ran on the cigarette lighter if the car had one. Then you would pull out 15 feet of electric cord and plug it in. When all done this cord had to be folded up and stuffed back into the mini compressor. Now along came a device called the “Daysaver battery”. The scene went like this. While still sitting in his three wheel cart this person wheeled up to the trunk and retrieved the battery and very small compressor. Took out about 3 feet ft of electric cord plugged it into this wonderful battery. This whole procedure took 15 min as compared to the previous method which took a good 30 min. These batteries are hard to find. The seller of these batteries should make them more available so others could benefit from them..
Just wanted to write in to you to say how incredibly pleased I’ve been with my 2m/440 Elk! I picked up one at the tail end of Pacificon on Sunday and then also spoke with you a week ago about sorting out a stand solution. 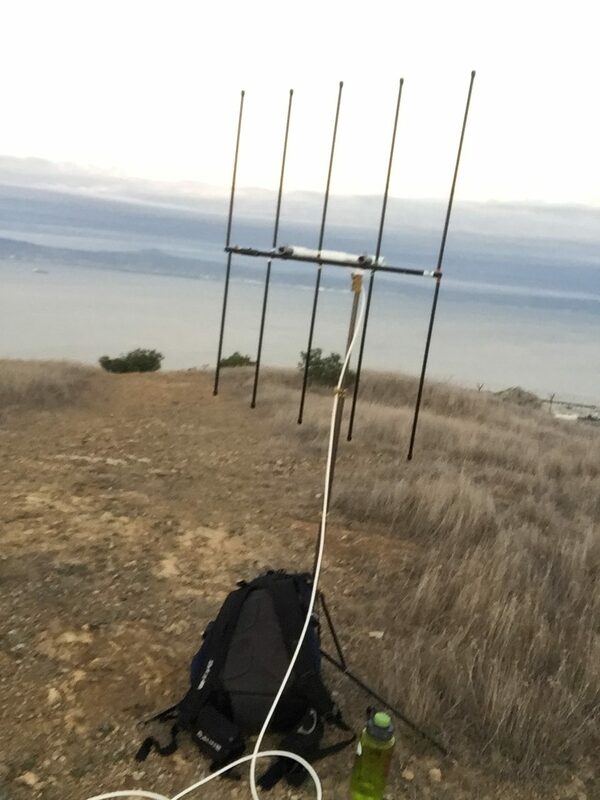 Yesterday I took it a bit of the ways up on the San Bruno Mountain ridge and had a go on 2m simplex and I including everyone I spoke with was blown away with the reach and quality of signal I was getting. Several folks in turn were at home and concluded in our conversation that the Elk Antenana was going to be a new purchase for them to consider as well! Also attached is a photo of the stand setup I worked out. I didn’t get a very good photo as it was already quite cold with sunset and winds were picking up so I was hustling to get myself packed up! Hi folks, it! 10:10 AM here at BocaRaton Regional Hospital and we’re in the midstream of hurricane Irma. The coax to our main dual band antenna seems to have water intrusion. I set up the antenna as shown and is working AWSOME to get thru. I am very impressed. Will second picture. Just five minutes before the conclusion of the VHF contest last weekend I made a QRP contact with Brian/KK6ZIZ/Benicia, CA. We were both running 5.0 watts out on 146.490 MHz simplex.Brian was using a hand-held in his car. I received him about a S-3 signal strength, some white noise, but contact made thanks to the ELK beam, probably would never have heard him otherwise. Quite amazing!!! :-):-) I have a second ELK reserved for portable/emergency use.CU @ PACIFICON. Ran 800mW from a TYT TH-UV3R hand held and reached the Pacifica repeater/WA6TOW a tiny bit of noise behind my signal but very readable as noted from W6EZE/”Chris” near the repeater. Quite amazing. With 2 watts out Chris reported I was full quieting!!!:-):-). Truely amazing. The beam is still rotatable up about 40′. Most mornings continue to receive good reports from “Ben”/WB6GBS/Fresno over the W6TO repeater.I am running about 150 watts during this time and beam position is critical.Very very amazing.But that’s why I purchased a second Elk for portable/emergency work. I have been using this antenna for years and have recently purchased another, but I think you are “missing the boat” by not actively marketing this model to ARES. The antenna is a natural in that role! IMHO every ARES organization NEEDS to have several of these. I used one in Southern Oregon in ARES roles. I carried various length of poles (masts) in the back of my truck, mounted on a patio umbrella weight. No, I didn’t use it mobile. One role was to see how fast I could deploy a 2m/440 rig to the mountains, along with a HF rig and get set up and operating. 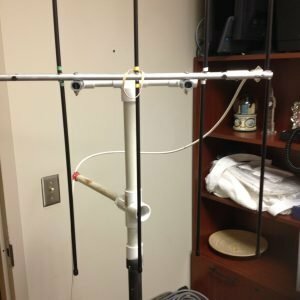 Your antenna made the VHF/UHF set-up easy! Recently moved back to Texas and will be exploring new roles for this antenna. I purchased this excellent antenna December 23rd 2014 at HRO Atlanta. I don’t have a permanent shack, I use a go kit on the dining room table a couple times a week to check into local nets. I disassemble and reassemble each time. I find that the antenna build quality is excellent and the assembly is so easy a cave man could do it. ?While over Christmas break I made a contact over 100 miles on 5 watts to check into a weather net. I’m extremely impressed with the performance for such a small package. I also have used it indoors during bad weather to check into nets with one watt, that the jpole outside needs 5 watts. If you can’t tell I love qrp. If you don’t have an elk antenna you are really missing out. Well jim, i just had to let you know……….one of the clubs i belong to, had a fox hunt…..there were 8 contestants……i found the fox first….. i used the elk to get the first bearing and second bearing…..then switched to a loop antenna and finally no antenna…. the time limit was 2 hours…i found the fox in 45 minutes…..
NASA astronaut Reid Wiseman KF5LKT, operating as NA1SS from the International Space Station during the 2014 ARRL Field Day on Saturday, June 28, 2014, at 1815-1822 UT. After announcements of possible participation of the ISS amateur radio station in the 2014 ARRL Field Day, it was nice to hear Reid on the radio. Among the stations making contact with NA1SS on this pass, I was able to make a brief contact as the ISS was about to go over Arizona. The WD9EWK station used for this contact, and to record the NA1SS audio, was an Icom IC-2820H 2m/70cm FM mobile transceiver, transmitting at 5W into an Elk Antennas handheld 2m/70cm log periodic antenna. The radio was powered by a 12V/26Ah jumpstart battery. I thought I’d write to you about the 2M/440 L5 Antenna results. I ended up ordering the PL-259 silver/teflon connectors and RG-8A/U (#CQ106 Super 8) along with an RG-174, 36″ extension SO-239 to SMA male from http://www.thewireman.com. Everything arrived last Friday and I put them together the next day. Very impressed with the quality of the custom manufactured coax I got from them and the price was excellent too. On Saturday afternoon I went out and tried the antenna hooked up to my VX-8DR at 5W. Amazing is all I can say Jim! I normally have trouble accessing the satelites with my rubber duck when there is heavy cloud cover. We had black skies that afternoon and you almost could not see the sun shining through. Pretty much a worst case scenerio here. Once I hooked up the Elk antenna I could easily access them every single time! I was also astounded by the fact that I made a repeater contact on 2M way up in Bloomington, IN with the Elk. That was an 85 mile trip! All I can say is that I am VERY pleased with the antenna and now wonder about the mono-band 220 and 440 antennas you have there. Jim, I can’t wait to try my new antenna out this weekend up on a huge hill nearby. God only knows how far this thing will reach out! I have a Elk antenna and really like it. I point the antenna to the weakest repeater and it hits other repeaters off the sides. When I check into 4 of 5 nets on Sunday night I don’t have to move the antenna, but just change frequencies. I love the PVC mounting system I have added several 2 foot sections and build a base so the antenna stands by itself. This is great. I was demonstrating SWR at a Technician class and had to use another antenna. The Elk Antenna was flat from 108 to 174 MHz. with a SWR of less than 1.2 to 1. That is very impressive. “I bought two of these antennas. Put one up above my house and one above my shop. At the same time I had a M2 5WL with one and a M2 18XXX with the other. Hurricane Ike relieved me of both M2’s and the Elk’s remained intact with the exception of one element. I called the folks at Elk antenna to order another replacement and they sent one out to me without charge. Excellent folks to do business with and those little 24″ antennas will surprise the dickens out of you on performance. “I received my Elk Antennas 2M/440L5 log periodic as a Christmas gift in 2006. In the past few weeks, I finally got around to making a PVC handle for it, and now it is my antenna of choice for portable satellite work. Before the log periodic, my directional antenna for portable satellite work was an Arrow Antennas dual-band Yagi. A good antenna, and one I have used for over 3 years (and owned for at least 6). 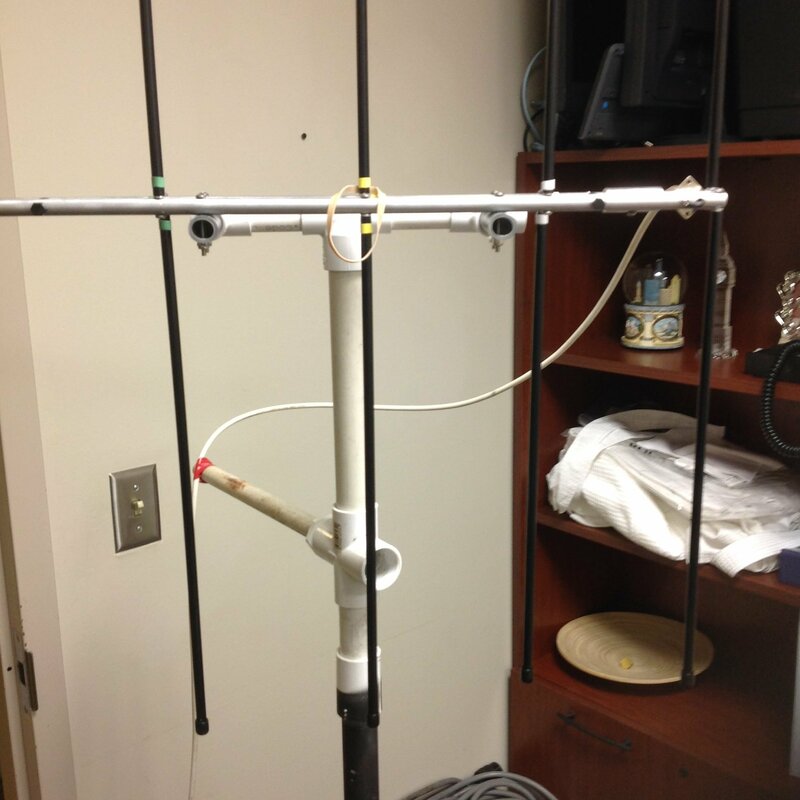 In January 2009, I made a PVC handle for my log periodic, and decided to try working the satellites exclusively with that instead of the Yagi. When working the same types of passes I would try in the past with the Yagi, I could hear the satellite closer to the horizon with the log periodic. 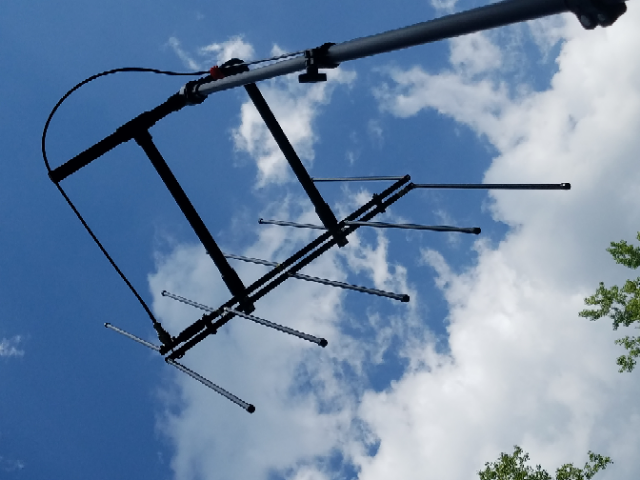 I have been able to turn shallow passes, with maximum elevation of 5 or 6 degrees, into productive passes – something I would rarely, if ever, do with the Yagi. On the FO-29 satellite, I would need for the satellite to be at least 25-30 degrees above the horizon to hear it clearly on my dual-band Yagi. I would probably need a preamp to improve on that. Using the log periodic, I have been able to hear FO-29 closer to the horizon (between 5 and 10 degrees). This satellite is now fun to work, and may let me have some success on the old AO-7. This is a great little antenna, and not just for satellite work. It can be a antenna for a home station, used for VHF/UHF contesting, as well as for satellite work. It is now a permanent fixture for my portable satellite station. 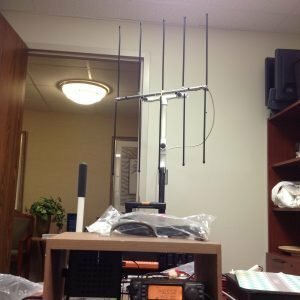 “I just wanted to comment on my first day results with this antenna. Today from DM13, I listened to the ISS crew talk with a class of kids. On the next pass, I made contact in Arizona. A few hours later I made contact with Kansas City on AO-51 (on a 15 degree pass). This was as exciting as my first HF contact. I aimed the antenna by hand and used it with my FT-60. I had attempted working the birds for weeks with various antennas but could never even hear them. Your new dual bander is just great! I was able to adapt it for hand held use for working OU-14 satellite in about one hour with great results. Assemble the antenna in about 3 minutes, unless you’re color blind. I used a scrap piece of 1 inch PVC pipe as my handle with a 90 degree ell into the mounting structure. I used a 24 inch length of thin wall 3/4 inch PVC pipe that I slid over the coax and the PL 259 fitting. I held this in place by stuffing a small piece of foam rubber into the PVC. This arrangement easily satisfies the requirement to have the coax run at 90 degrees from the antenna for at least 19 inches. 20 minutes on this max. Most of my time was spent programming the Doppler shift frequencies into my IC 706MKIIG, 30 minutes on this, probably less if I had read the manual first. I already had the pass predictions run from Sat Scope so I went out on the deck in my backyard with the 706 and a Gel Cell battery and waited for ASO. I used a cheapo compass and just eyeballed the elevation. Wait a few minutes. As soon as I heard the FM quiet, I called W6DXO QRZ OU-14 and got a call back almost immediately … really easy. I have worked OU-14 for the past 4 days with no trouble at all. SWR on 144 is almost flat.. about 1.2:1 across most of the band. You don’t need a fancy carrying case, just use 2 or 3 rubber bands to hold the elements to the boom for transport or storage. No duplexer, just coax and a radio. If you want to experiment with the OU-14 satellite and have a radio that will run 144/430 and a 10 foot length of coax, you’re ready to go. If you spend more than $4 bucks on this, there is something wrong! This is really a well executed design. “Just wanted to tell you how satisfied I have been with the 2M Log Periodic antenna. 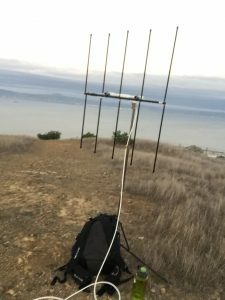 I installed it on a mast on the roof and have it pointed North to access the Berryessa repeater, 90 to 100 miles from my QTH in San Jose. Results have been very good, until I got the LP, I used a J pole and was always marginal, even with 25 watts. Now with the LP, I can have a solid QSO with my friend Jim, W6RWI, in Sacramento with 5 watts.